Longing for comfort food? 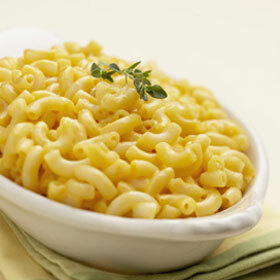 Try this clean eating macaroni and cheese. You'll love it and so will everyone else! Lightly grease a 1½ qt. casserole dish with olive oil. Add flour and salt to medium bowl and whisk in enough milk to make a paste. Whisk in remaining milk until no lumps remain. Place a medium saucepan over medium heat and add flour milk mixture. When milk is warm, add Swiss cheese and stir until melted. Add cheddar cheese and stir until melted and mixture begins to thicken. Stir in cooked macaroni and transfer to casserole dish. In a small bowl, stir together breadcrumbs and Parmesan. Sprinkle over macaroni. Bake 15-20 minutes or until top is lightly browned. Allow to stand 5 minutes before serving. Makes about 6½ cups.